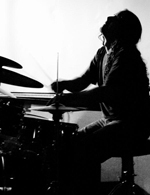 This month we feature an interview with jazz drummer and composer Rodolfo Zuniga. Born in San Jose, Costa Rica and now residing in Miami Florida, Zuniga is the leader of The Rodolfo Zuniga Quintet, a young contemporary jazz group that is causing a stir in the Miami music scene. Zuniga released his debut album Premonition last November 2006, including compositions by himself (listen to tracks below), Fernando Ulibarri and Rob Smiley. In 2005, his band was featured in a one week residency with Dave Douglas that culminated in a concert at Carnegie Hall. Zuniga is also active as a sideman in the South Florida scene with jazz names like Gary Campbell, Michael Gerber, Alex Norris, Othello Molineaux and Ira Sullivan. In our recent interview with him, we had the opportunity to hear about the views and insight of a young jazz musician and composer of today. You can learn more about Rodolfo Zuniga and his band at www.rzquintet.com (photo by Tom Laveuf). Premonition (Zuniga) – The Rodolfo Zuniga Quintet, from the album Premonition. Personel: Robert Smiley tenor and alto Sax, Lasim Richards trombone, Fernando Ulibarri guitar, Michael Bordelon acoustic Bass, Rodolfo Zuniga drums. Personel: Dave Fernandez tenor sax, Dave Seagal piano, Gabriel Vivas bass, Fernando Ulibarri guitar, Rodolfo Zuniga drums. ComposersNewPencil: When did you start writing music? improvisation for drummers. The teacher related improvising with composing and how improvising means writing in the moment. At that moment I realized how rewarding writing a piece is. CNP: How do you start a piece? R.Z. : It can start in various different ways. A melody, rhythm, or combination of both can be in my head and that becomes the starting block for a piece, sometimes I just think about a texture or a vehicle for improvisation and that triggers a composition. On a few occasions the music just wants to come out and it almost does by itself when I sit on the piano. CNP: Can you talk about the difference between writing for your band, where you have a specific ensemble of musicians you are familiar with, and writing a composition without specific players in mind? R.Z. : This is a good question, for me it makes a lot of difference. I personally enjoy writing for people’s personalities. It is something that I relate to and usually gives me better results. When I write without somebody specifically in mind the composition has a tendency to go through some changes before I feel completely satisfied with it. For me the beauty of composing is the process by which the performer gives the music life and his own sound, so if I know the performer well, I can almost predict the outcome. CNP: Can you describe the process a composition goes through once you bring it to a rehearsal? R.Z. : Usually I go through the form, character and directions for the performers first. If the piece is very challenging I try to rehearse a few hard sections first. After that, I run the chart from beginning to end so that the musicians can get a feel and understanding of the whole intent of the tune. After this, I focus on specific sections and mistakes, and if the piece seems to work, I move on and come back to it later. Usually when I come back to it, it already has a life of its own. CNP: Do you listen to other types of music other than jazz? R.Z. : Yeah, definitely the influence of other genres helps my creativeness. I think they help me evolve as a musician in general, not only as a composer. For me, being a musician means being very open minded and always evolving. CNP: What do you think about the state of jazz today and all of its different currents (styles, tendencies)? R.Z. : I think musically there is a lot going on in jazz, great composers and performers and there are definitely some different tendencies. Some guys write more through-composed material, others are just writing very modal things that turn very free, some people write in the tradition of somebody else, and some are always pushing the envelope on creativeness. I think it’s a great time for jazz, there are so many projects and so many young writers; it is very encouraging. Seems like everybody has something to say. Unfortunately, the business side of it is not the best. It’s very difficult to get treated right and recognized as a jazz musician, not enough places to perform and little outlet to perform original compositions. The one good thing is that you don’t necessarily need a record label to support your album, you can record and at least get your CD out there for people to listen to. The hard part is getting it performed, but maybe that will change. CNP: Can you talk about the experience you had at the Dave Douglas Workshop and playing in Carnegie Hall with your quintet? R.Z. : It was a great experience for a lot of reasons, but the main one for me was the faculty. Dave Douglas is a an incredible composer and trumpeter. He was very supportive of our material and always trying to make us realize that we should open up and let our own compositions evolve. He always found a way to make us sound better every day. Apart from that, he brought a great faculty with him: Marilyn Crispell, Andrew Cyrille and Greg Cohen. They are all composers and performers with a lot of experience and super open-minded musicians in general. They all had a different approach in coaching our group and it was also great to see them rehearse and perform together. I have been part of other workshops and this one by far was my favorite because of the freedom involved in the coaching. CNP: Are you influenced by other jazz drummer-composers, being one yourself? R.Z. : Yeah definitely, I feel that drummers need to be able to write music and lead a band in order to make them better percussionists. The more you understand about the musicians you play with, the better you can perform with them and I think being a composer makes a huge difference there. My influences have been drummer/composers like Tony Williams, Andrew Cyrille, Bob Moses, Paul Motian, Brian Blade, Eric Harland, Clarence Penn, etc., etc. The list goes on. CNP: How’s the market today for a jazz composer? R.Z. : The market as a writer is not that bad. As I mentioned before, you can produce your own record, sell it online and get people to listen to it. The model of a big record label is not as prominent anymore. The real problem is finding enough work to perform your original compositions. Rodolfo Zuñiga is one of the best performers I have ever known, watch and hear him play live and you’ll see!